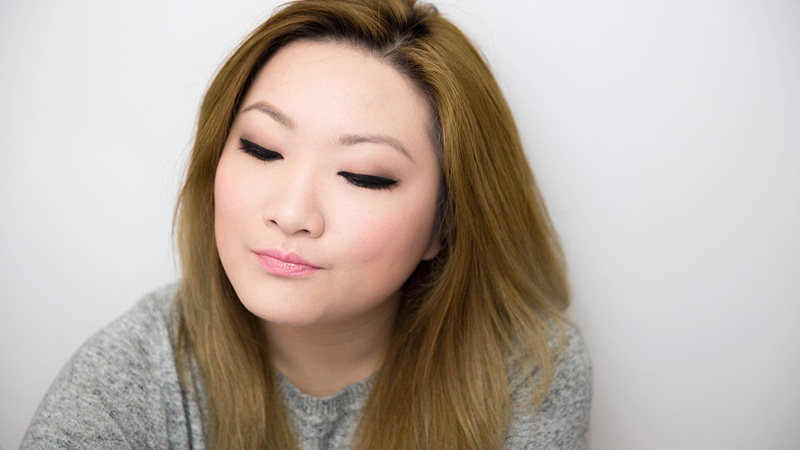 Neutral & Subtle Smokey Eye + Giveaway! I’m so excited about this makeup post I’ve been working on last week! Today’s look is something I like to put on for everyday occasions. That means coffee dates, shopping or even brunch! It’s taupe and brown based with an unoffending lip color. The tones are neutral and natural to bring out the best of your natural colors. I like to call this natural freshness. This makeup look will feature two Rimmel London products: Stay Matte foundation and Scandaleyes Retro Glam mascara. First I start with the Stay Matte foundation in 091 True Ivory, and apply with a brush all over. It’s really lightweight and concealing so I won’t be following with a concealer. The next step will be applying primer on my eyelids and under my waterline. For the brows, I just filled it in according to my natural shape. I want to just accentuate my features. Then, I take a brown creamy pencil and draw in a large wing. That will be the base for the shadows. Simply, smudge it out with a brush. Now, I will be layering on the eyeshadows. First, I apply a taupe color all over my lid, up to my brow bone. Blend. On the outer corner, I add in some brown in a v-shape and bring it inwards a little. Take more taupe to blend the brown in. With a fluffy brush, buff out any harsh edges. With the brown liner, apply along the water line. I will then smudge it out with a brush with some brown shadow on it. That will enhance the smokiness of the eyes. Now, my favorite part. With a liquid liner, I draw in my winged liner. Then with a black waterproof pencil, I tightline my lash line and lightly line the waterline. This will help shape and bring out my eyes. To really make it pop out more. Curl the lashes and apply the Scandaleyes Retro Glam mascara in 003 Extreme Black on both top and bottom lashes. It has an hourglass shape to give the wide eye look. I can actually see my lashes after a few coats with this! I like to add bronzer to contour and bring my dimension to my face. I do this under my cheekbones and into my jawline. Afterwards, I take a pink blush and apply it on the apples of my cheeks — blending it into my bronzer. Finally, I used a coral pink lip gloss to complete the look. See my video for a 3D visual. Here’s where you can get your hands on some Rimmel makeup. It’s available at Walmart if you want to purchase it like me. There’s a $1 coupon in the Sunday newspaper for Rimmel’s 180th anniversary this April. Or, you can enter the giveaway below to win a gift basket worth $50 of popular Rimmel product. 25 winners! See below. https://www.tineey.com/wp-content/uploads/2014/04/1H4A2033.jpg 579 1030 Tineey http://tineey.wpengine.com/wp-content/uploads/2014/03/tineey-logo.png Tineey2014-04-14 08:07:572016-04-13 15:13:36Neutral & Subtle Smokey Eye + Giveaway!